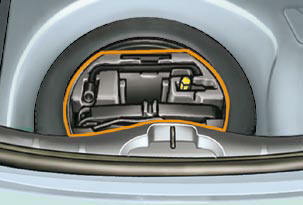 The tools are installed in the boot under the fl oor. unclip and remove the box containing the tools. All of these tools are specifi c to your vehicle. Do not use them for other purposes. Permits removal of the wheel trim and removal of the wheel fi xing bolts. Permits raising of the vehicle. 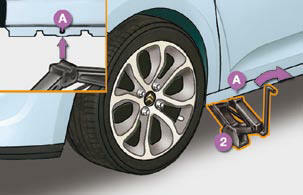 Permits removal of the bolt protectors (covers) on alloy wheels. 4. Socket for the security wheel bolts (located in the glove box). Permits adaptation of the wheelbrace to the special "security" wheel bolts. 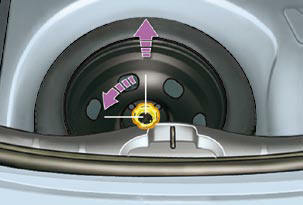 When removing the wheel , fi rst detach the trim using the wheelbrace 1 pulling at the valve passage hole. When refi tting the wheel , refi t the trim starting by placing its cut-out at the valve and press around its edge with the palm of your hand. The spare wheel is installed in the boot under the fl oor. 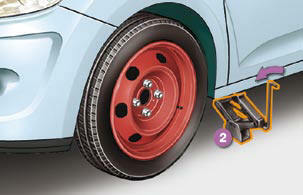 According to country, the spare wheel may be steel or of the "space saver" type. If your vehicle is fi tted with alloy wheels, it is normal to notice, when tightening the bolts on fi tting, that the washers do not come into contact with the steel or "space-saver" type spare wheel. 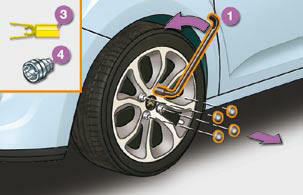 The wheel is secured by the conical contact of each bolt. Refi t the boot fl oor carpet by lightly folding it in two (refer to the section "Fittings - § Storage box"). 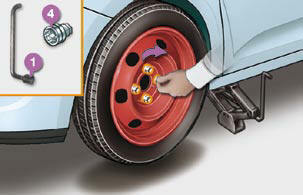 On vehicles equipped with a "space-saver" type spare wheel, the punctured wheel cannot be stowed in place of the "spacesaver" wheel. 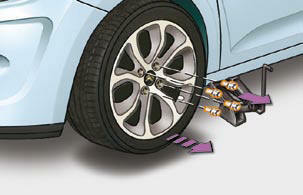 Immobilise the vehicle where it does not block traffi c: the ground must be level, stable and not slippery. 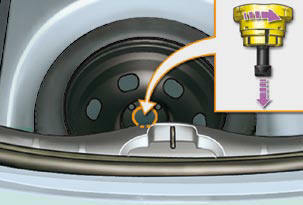 Apply the parking brake, switch off the ignition and engage fi rst gear * to lock the wheels. Remove the chromed bolt cover from each of the bolts using the tool 3 . Fit the security bolt socket 4 on the wheelbrace 1 to slacken the security bolt. Raise the vehicle until there is suffi cient space between the wheel and the ground to admit the spare (not punctured) wheel easily. * position P for an automatic gearbox. 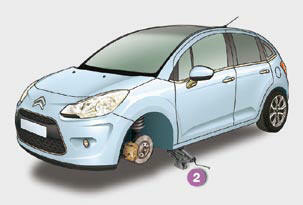 To store the punctured wheel in the boot correctly, fi rst remove the central cover. 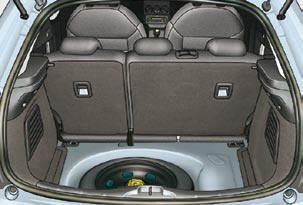 When using the "space-saver" type temporary use spare wheel, do not exceed 50 mph (80 km/h). 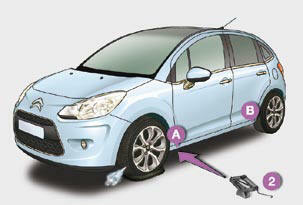 Have the tightening of the bolts and the pressure of the spare wheel checked by a CITROËN dealer without delay. 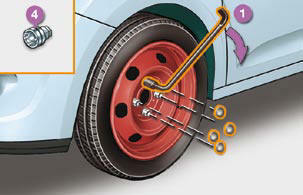 Do not drive with more than one temporary use spare wheel fi tted to the vehicle at one time. Screw in the bolts by hand. Pre-tighten the security bolt using the wheelbrace 1 fi tted with the security bolt socket 4 . 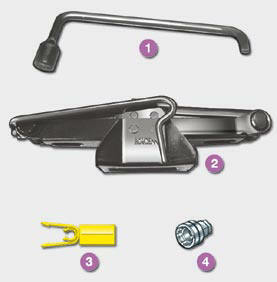 Tighten the security bolt using the wheelbrace 1 fi tted with the security bolt socket 4 . Refi t the chromed bolt covers on each of the bolts.